Ok, I will admit it, I am completely geeked out right now. I just downloaded the alpha version of the BlueStacks Android app player for windows. Running my android apps on Win 7 is really intriguing to me because it amplifies a perspective I have held for some time. Our lives are no longer defined by what hardware we run no matter how strongly Apple and Microsoft try to push. I can run Evernote, Maps, Gmail, Office apps, Netflix, Youtube etc on any device I want. The difference between owning an ios device or android device is fairly moot already. This power we have as users has never been greater. I will use the example of Evernote, probably my favorite application. I can grab a snapshot from my phone and it is automatically synced with any other device I own. Within a short time I can pick up my tablet(ASUS Transformer), my Win 7 laptop or login to any computer and my picture is right there. I can annotate over the image on another device and it is synchronized back to my phone and everywhere else I might use it. This is not just cloud computing, this is application centric life. If I want to go purchase an ipad tomorrow I simply download the Evernote app and start using it. Absolutely no hiccups in the process, all of my notes for the last two years are right there. What I was running it on made no difference. The fear that must be present in certain Boardrooms around the world must be palpable as this realization takes hold. How do they continue to differentiate themselves? Geeks and Nerds will always care, but what about the average person? All they will care about is if they can run their apps. This opens a number of surprising doors and I believe we will see a number of new players jump through them. One door is the barriers to entry for new operating systems is very low. If you can support the open android apps you can play, we are about to witness this real-time with Amazon’s new Kindle offering. Here we have a company with money and content that is projected to be successful with a brand new operating system. Why? Because it no longer matters. We can laugh at the very competent attempt at owning the world by Microsoft, Apple and Google because we now have the power. Our application choice will drive these companies instead of them driving us. In this new world when we download an app we place our vote and impact our electronic future. Getting back to my geektastic experience with BlueStacks, I loaded it onto my media center pc. Powerful desktop mounted in my rack running Win 7. We typically use it for TV, DVDs, Netflix, Skype and general group web browsing. I installed the app successfully and I was able to run the various games and news applications that come with the alpha version of the application. Now the fun part, using their CloudConnect software I was able to push apps not preloaded to my pc from my phone. Being the addict, I immediately chose Evernote and pushed it to my pc. Once it loaded I was able to log in and use Evernote just like on my phone or tablet. Some might say it is no big deal to run Evernote, I can simply download the windows application and roll right along. The exciting part for me is the dynamic of the interface. One of the problems to date with media center pc’s is the interface is built around desktop computing. Complex navigation (a windows norm) and keyboard interaction make it difficult and cumbersome to use in a living room. A phone or tablet interface on the other hand is made for a less granular input. It is optimized for the type of input you would use with a wireless mouse or controller. 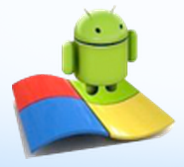 In other words it is easier to use android apps running on Win 7 than it is to use the native windows app. I found this to be true for Google Maps, Tweetdeck and others also. The interface was fast, clear and easy to use. What a novel idea. Many have heard me lament our servitude to the benevolent dictators at Microsoft and Apple. I truly believe those days are numbered and we are entering a new age. Not just a cloud computing age but the “Application Age” where we will be able to influence our future more directly. We will simply not use poorly made applications. We will no longer be force fed a way we must interface with our information. What an exciting time, I cannot wait to see what great applications bubble to the top!